It's hard. Trying to find a guitar amp that's perfect for playing at home that you can also gig with. You don't want to look like an unprofessional clown tipping up to the venue with a small micro amp, but you also don't want to look like a Slash wannabe lugging in a 100-watt six foot high Marshall stack. Luckily, with modern amp technology and PA sound systems there's no longer a need to crank a huge 150kg amp to the max to achieve that perfect driven tone. You can get stunning results from the most modest sized amps these days. Today, we've found 5 of the very best low to mid range wattage combo guitar amps that don't take up too much room and are the solution if you're after a practice amp you can also gig and record with. Love the warmth of valves? The all-valve tone of the ever popular Fender Blues Junior combo amp delivers crisp clear clean sounds. And as a result this amp is a blues and jazz guitarists dream. More of a rock guy? No problem. The Blues Junior is also an outstanding pedal amp. Just plug in your pedalboard and your pedals are complimented by the lush smooth undertones from the amp. With the classic Fender tweed design found on it's big brother the Blues Deluxe, the Blues Junior is simplicity personified. You don't need bells and whistles with this 15 watt amp. You get a single clean channel with Master, Middle, Treble, Bass and Volume controls. And the "Fat" and Reverb controls give your sound that extra radiance. You'll love: The stunning retro lacquered tweed design that'll without fail turn heads. With its 12 inch speaker, 55 customisable effects, 15 pedal fx and 5 amp sound settings, the Boss Katana 50 watt amp is one of the most popular small gig and home practice amp choices for a good reason. You get an impressive array of powerful tones that are perfect to suit every type of guitarists taste. And thanks to its clever Power Control that allows you to push the amps sound even at low volumes, the Katana 50 gives you flawless cranked-amp tone and is superb for home practice. Whether you're after a classic rock, shredding metal or smooth blues sound, because of the oodles of amp sounds and effects the Katana 50 has, you're not going to be disappointed. If you're after that classic Vox tone but don't want to fork out a months wages to get it, the Vox AC15VR will suit you down to the ground. This diminutive twin channel guitar amp features a 1x 12 inch VX 12 Celestion custom made speaker and optional Vox VFS2A dual footswitch input. The AC15VR can deliver those typical Vox Beatles and Byrds-esqe tones from the chimey Normal channel, or growling rock tone from the Overdrive channel. In all, the Vox Valve Reactor is a great amp choice for anyone playing medium sized venues, jamming at home, practicing with bandmates or playing worship at church. You'll love: The impressively loud sound when cranked up that'll have you double checking it's actually not more than the 15 watts advertised. Worth a mention: Vox AP2AC AC30 for those of you who want to jam in the dressing room before you hit the stage or have been told to shut up by her/him indoors at home. Packed full of sounds with spot on quality, Blackstar’s True Valve Power gives you 6 distinctly different power valve responses – EL84, 6V6, EL34, KT66, 6L6, KT88 (if you're interested). And thanks to the ID30's six different channels including Clean Warm, Super Crunch and OD, the amp delivers crystal clear sound with super tube emulation. Whatever your brand of guitar the Blackstar ID30 will clearly bring out the tone of your pickups. We definitely recommend this bad boy if you're looking for an amp that's lightweight in comparison to a tube amp, you like the diversity a modelling amp gives you, and you're planning on playing outside your front room. You'll love: The editing capabilities and online patch storing facilitated by the free Blackstar Insider GUI software. Now you can show off and share your killer custom made sounds with the Blackstar community. Worth a mention: Blackstar ID15 for those of you who want to spend a little less but get similar results. If you're looking for an entry level amp that's either your first ever amp, or backup home practice rig, the Marshall MG30GFX will suit your needs. The Marshall 30 watt MG30 has 4 programmable channels and digital effects such as delay, flanger and reverb. This cracking little amp is solidly built and won't cost you an arm and a leg. The timeless Marshall styling of this black & gold model looks class as an added bonus. Don't expect this Marshall offering to drown out your drummer unless you mic it up through the PA, do expect it to compliment your home practice needs. You'll love: The MP3/Line In and Headphone Output which means you can play along to that latest song you're learning in private. Worth a mention: Marshall 1962 Bluesbreaker for those of you who want to go hard or go home.. If you think about it, it doesn't make sense to just buy a small micro amp if you're planning on playing live. But it also doesn't make sense to buy a monster of an amp that'll quickly get you uninvited to Jim and Sue next-doors annual summer BBQ. As you've learned at the top of the review, thanks to advances in amp technology and loud PA systems, the average gigging amp has reduced in scale. 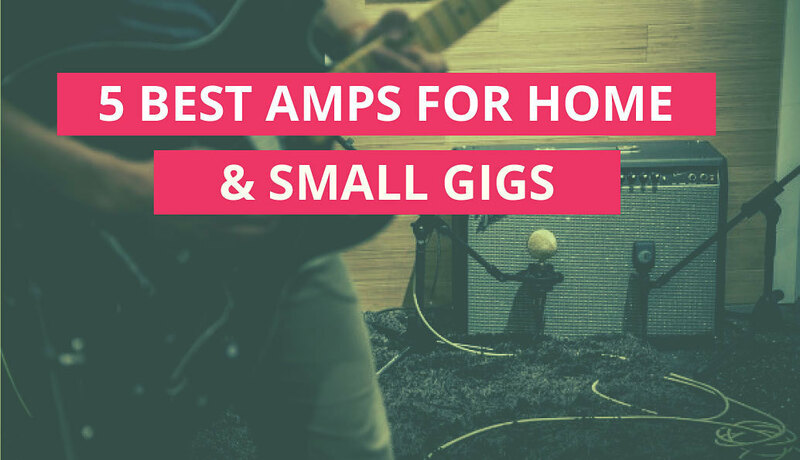 Thankfully now you can achieve the most lush of all-valve sounds in even a 10 watt modern amp as we've shown in the above list of 5 best amps for home use and gigs.